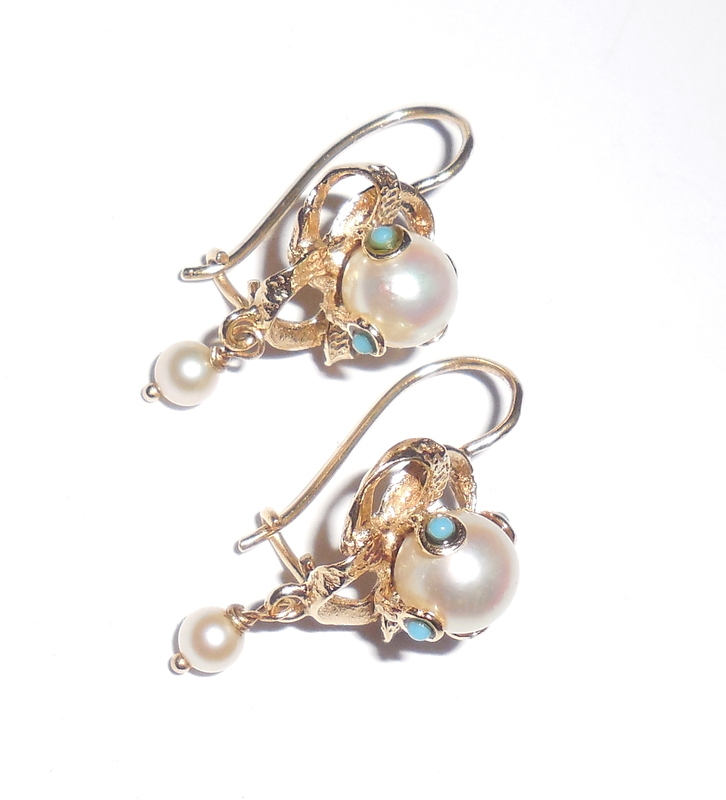 Antique Art Nouveau 14K Gold Pearl Persian Turquoise Earrings – This is a gorgeous pair of antique early turn of the century to 1910s fancy Art Nouveau pearl and turquoise earrings with their original long French hooks still intact. 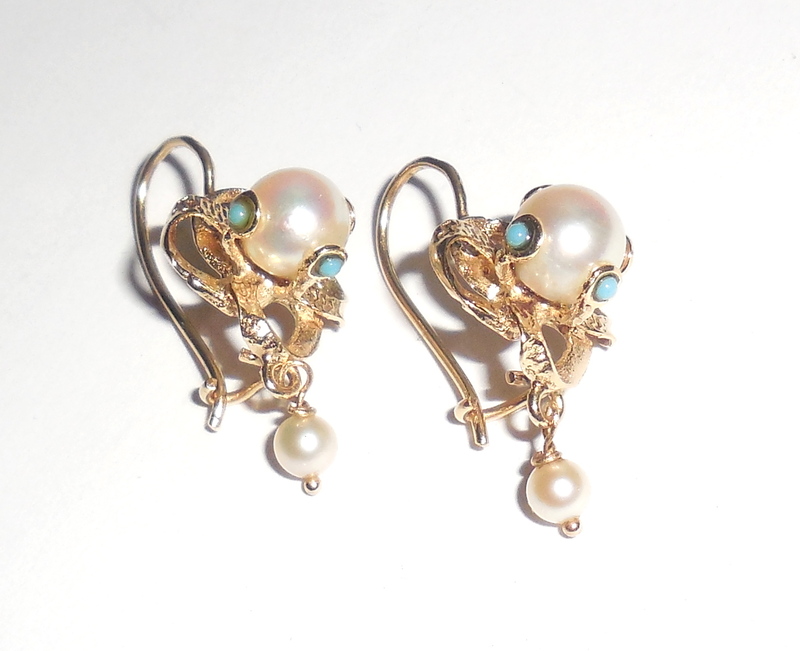 They have been jeweler tested and are Guaranteed solid 14K gold with their original pearls and stones in place. These earrings are quite early and were made by a goldsmith’s hand. You can see the old joints where the original goldsmith applied the old 2 part French hook. (1 piece French hooks are more modern). 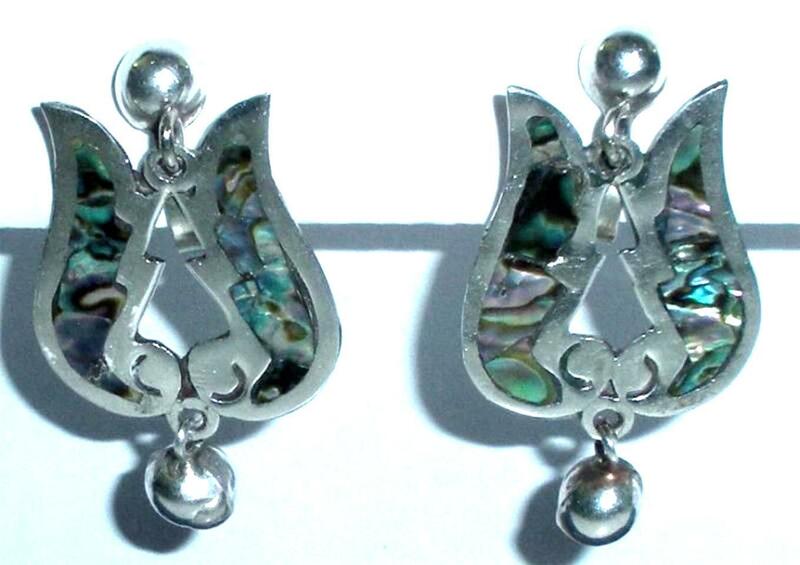 Each earring measures 1.12 inches north to south from top of hook on front to bottom of lower pearl dangle. East to west each earrings is just over 1/2″ wide across the gold ribbon setting. 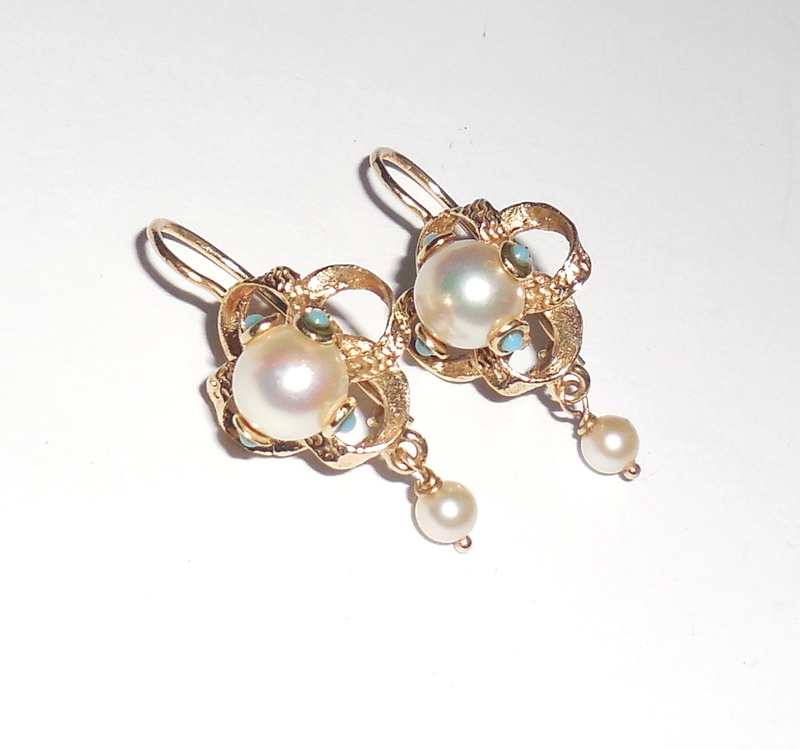 The fronts hold beautiful cream white pearls that are 6.5mm each and have good, strong luster with rose’ highlight. All of the pearls are well matched in size and color. The pearl settings contain tiny robins egg Persian turquoise accents that are bezel set and wrap around the perimeter of each pearl. These are very pretty and unusual settings! Combined weight of both earrings is 4.1 grams. Overall condition is original and excellent. No damage or repair. 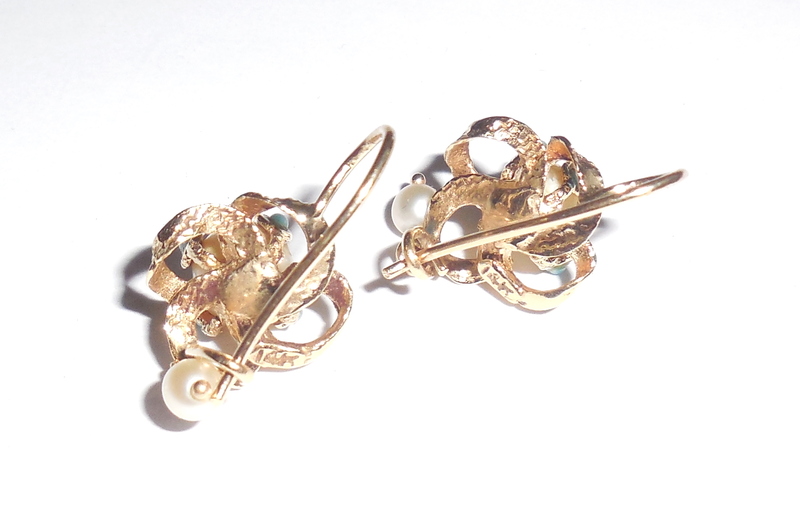 This is a very, very pretty pair of noticeable Art Nouveau earrings for your antique gold jewelry collection!! 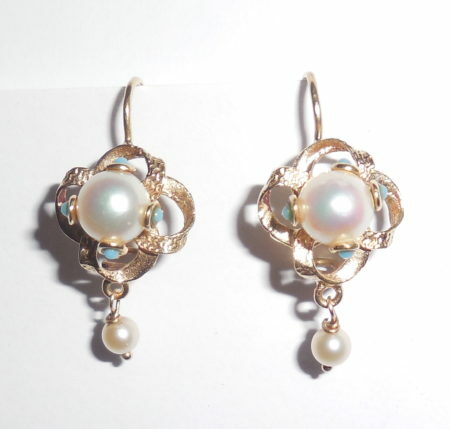 A pair of thick, solid, vintage 14K yellow gold, pierced-post, open iris half flower earrings with natural pearls. 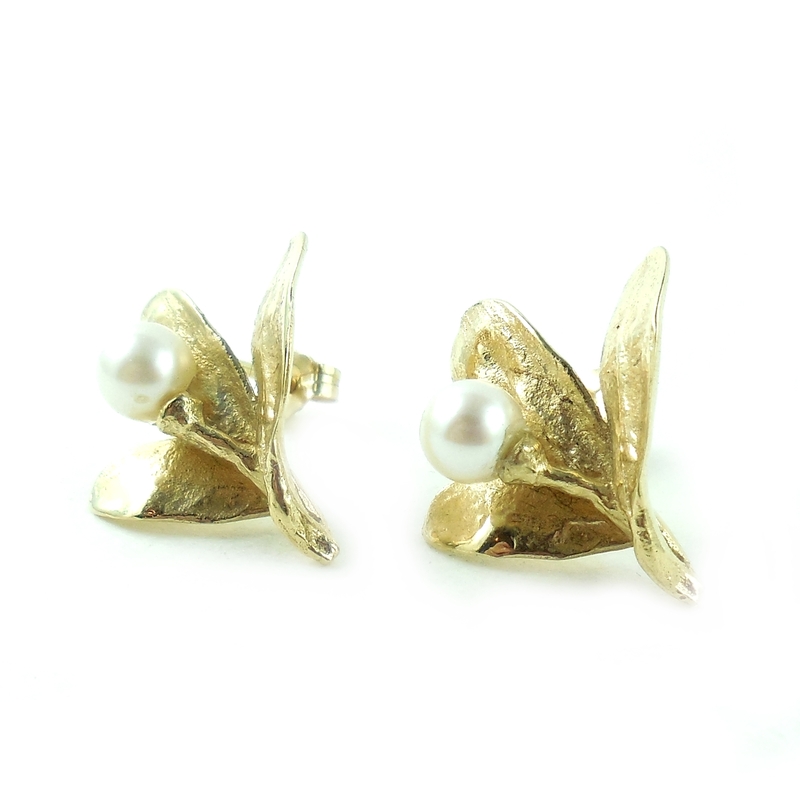 Butterflies are marked 14K and the earrings are tested and Guaranteed to be solid 14K gold. Size is just over 3/4" tall by 3/4" wide. The pearls are older cultured, excellent quality and 5mm each with beautiful cream white color. The 14K gold is very thick and extremely well-made. Weight is 4.8 grams. The gold has a showy brushed finish. 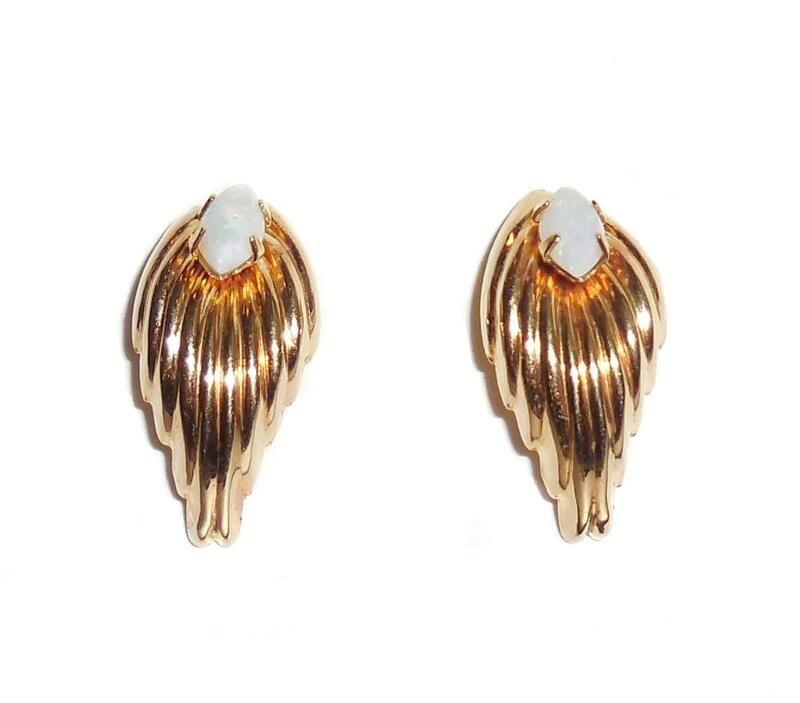 Small pair of 14K yellow gold curved leaf and opal earrings. They cup and curl around the bottom of the ear. They have .3carat of beautiful, colorful natural mined opal cabochon stones that are 6m by 3m each. The opals are better than average quality with bright colored hues like peach, aqua, turquoise, blue etc. No dead stones. Size of each earring is 11/16" by 5/16". Weight is .8gr. Condition is Vintage without tags; Old Store Stock, Excellent Condition. 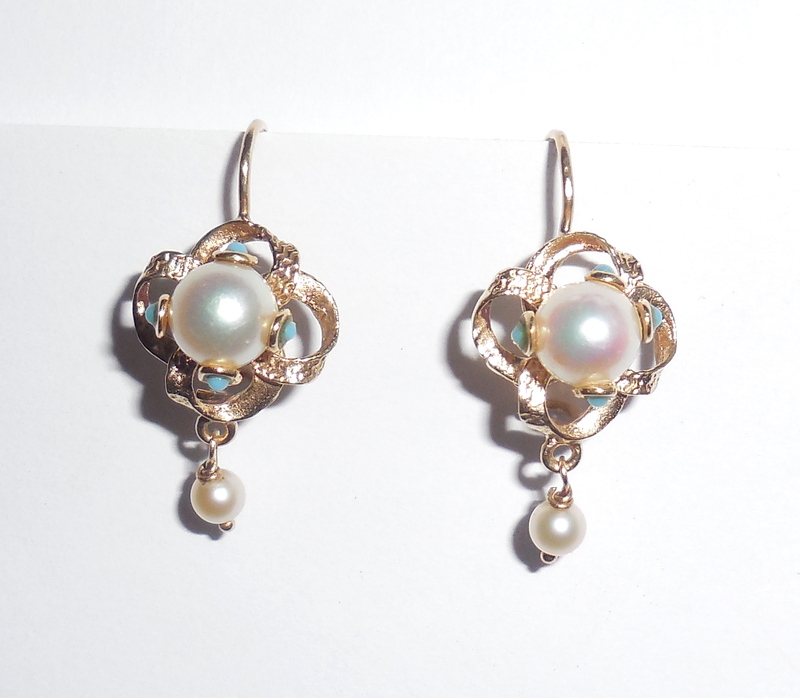 Lovely natural opal earrings for any occasion. This is a pair of very fancy vintage 14K yellow gold pierced hoop earrings. Marked 14K and guaranteed to be solid 14K gold. They have very fancy etched diamond cut work that sparkles against a fancy textured background. Size of each earring is 1" tall by 7/16" wide by 1/8" deep. Weight is 2.8 grams. Condition is excellent, very carefully used. No damage dents or dings. No repair. They are well made and showy. 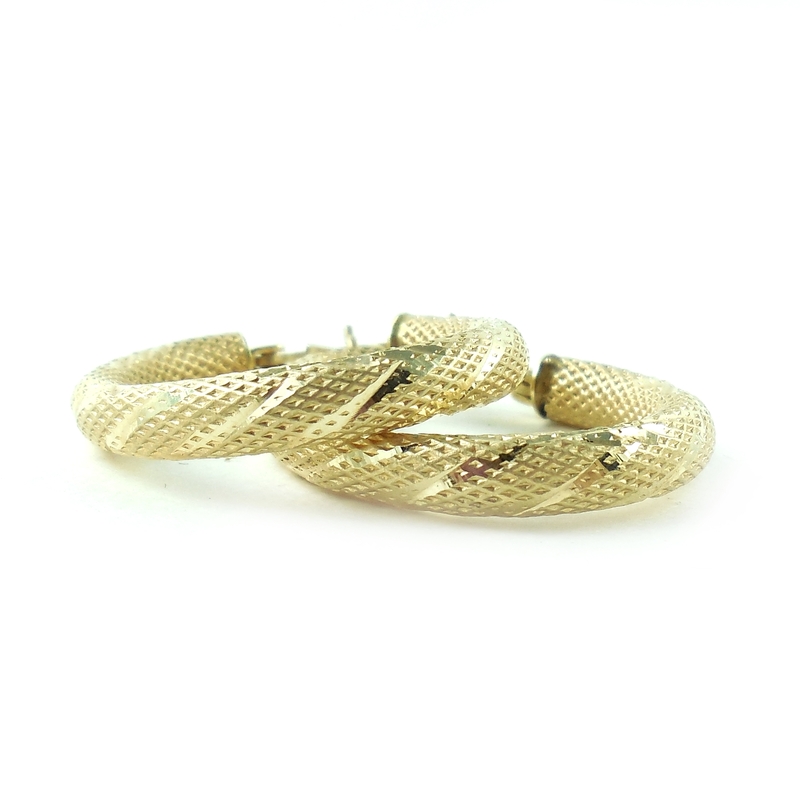 A lovely pair of vintage hoop statement earrings for any occasion.